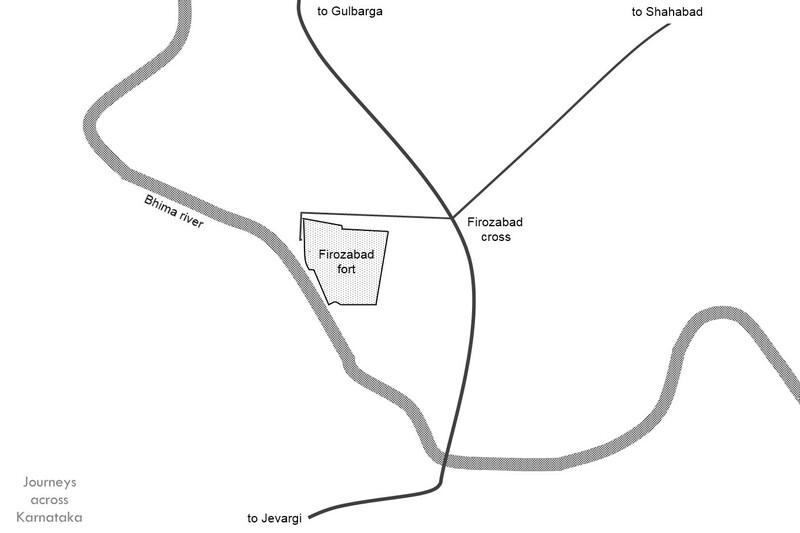 Firozabad is situated 34 kms south of Kalburgi city, on the left bank of river Bhima, a tributary of river Krishna. 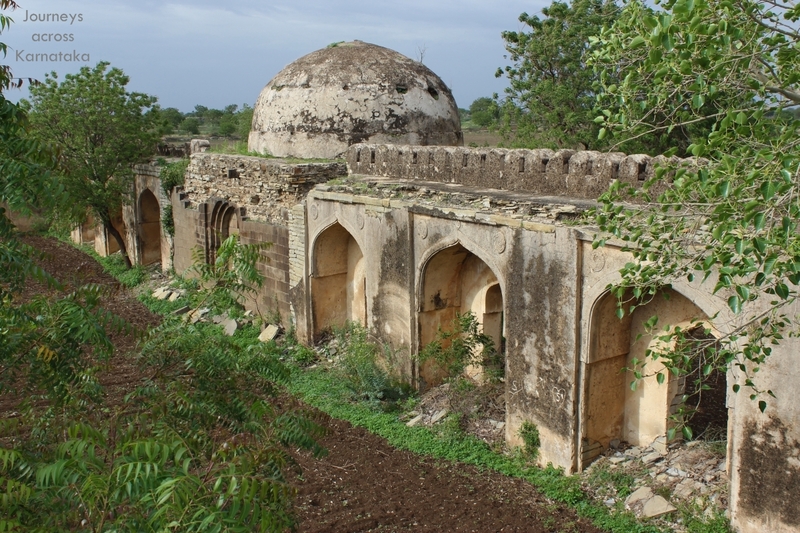 It was founded by the Bahamani Sultan Taj ud-Din Firoz Shah in 1410 CE. It is said that the citadel served as a royal resort and also as army barracks. 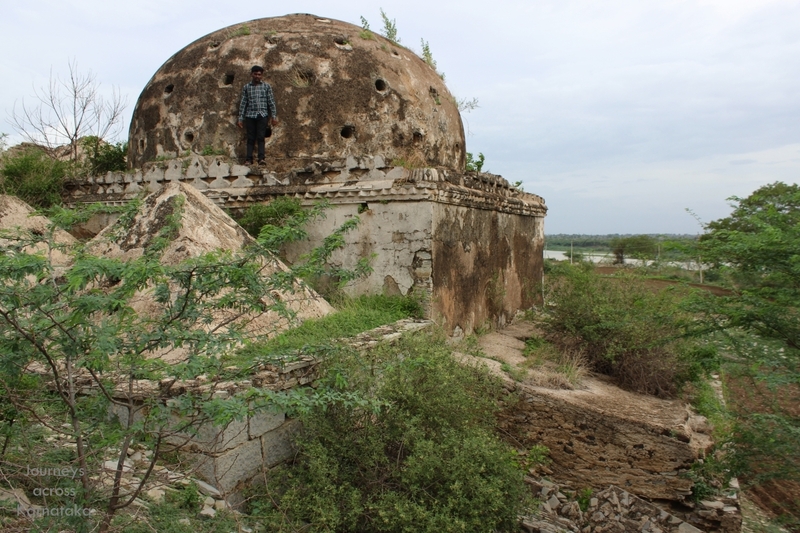 Another source says the city existed two decades until a great flood drowned the entire place. During the flood some 600000 Rupees were lost, after which place was abandoned forever. 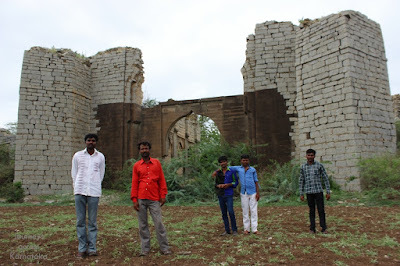 We were driving from Dharwad to Gulbarga; had stopped at Kudala Sangama, Basavana Bagewadi and Muddebihal. 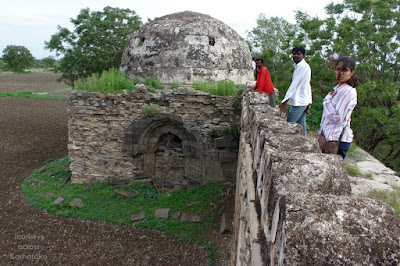 After Basavana Bagewadi, we went towards Bijapur to see the ancient trees planted during Adil Shahi times. 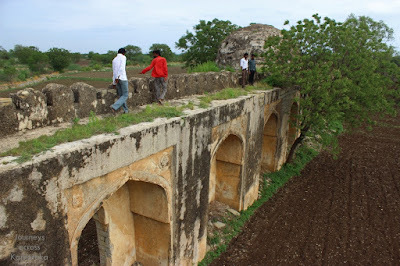 But our plan changed on by-pass road and we headed towards Gulbarga.. 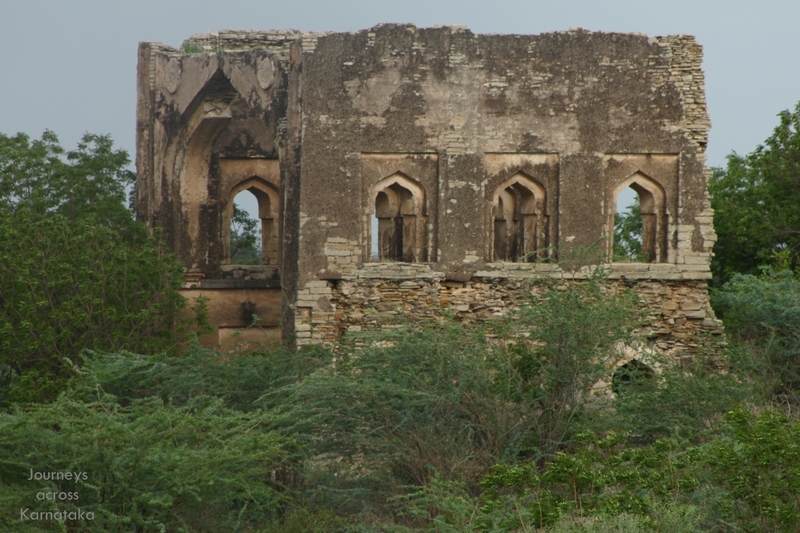 I wanted to reach Firozabad fort before sunset. No such luck it was dusk when we sighted the rampart walls. We drove into the fields, as far as my Santro managed, got few snaps of few bastions and rampart walls. With little light left we managed to drive further down towards the village and sighted a gateway. I tried reaching the gateway but finding a way through the maze of thorny bushes was a challenge. Our journey started at Hyderabad early morning; we stopped at Sedam, Bijjanahalli and Nagavi to touch their historical monuments. Ai Nagavi I was little worried of time but the road from Chittapur to Shahabad to Firozabad cross was good. 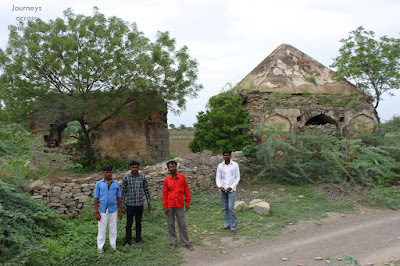 We reached Gulbarga-Jevargi road by 4 PM; another 10 minute drive to the village. On the way we stopped by the western gate I'd tried reaching last time. 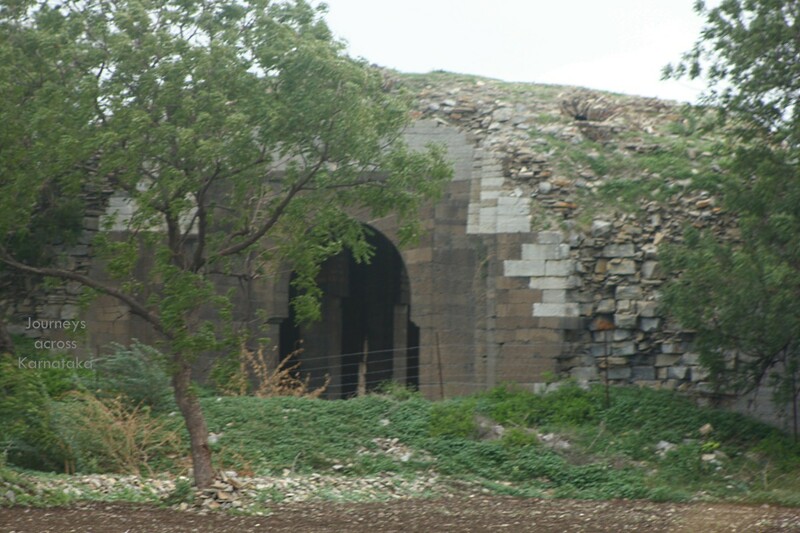 As you see the gateway is fenced, so the only way to enter the fort is from south. Pushpa shot this picture through the window with the telephoto lens. We reached the south side where all the houses are situated. 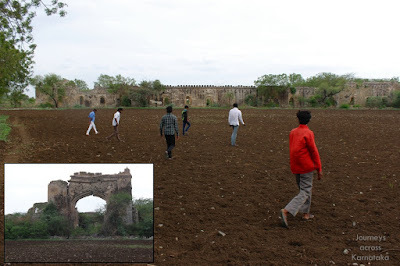 We stop at the entrance where a bunch of youngsters were playing cricket. When I began inquiring if anyone could accompany us to the fort, the game halted and village boys gathered. Finally four of them volunteered to be our guides. We left our car and followed our guides on a foot path. Barely 5 minutes later we came across these ruins. 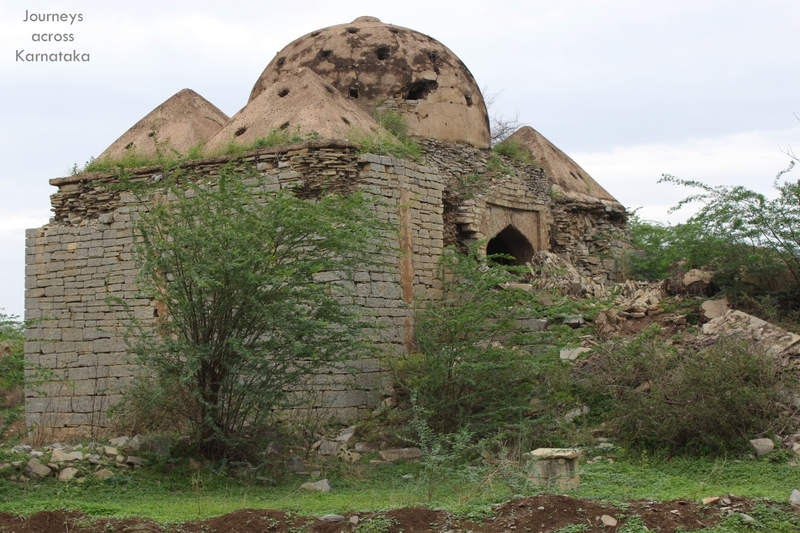 Two ancient structures; one with a pyramidal dome. Immediately to our right was a mass of ruins. It seems like these are two ruinbs of two large buildings.. probably royal palaces. We could not venture into any of them because of thorns and foul air. 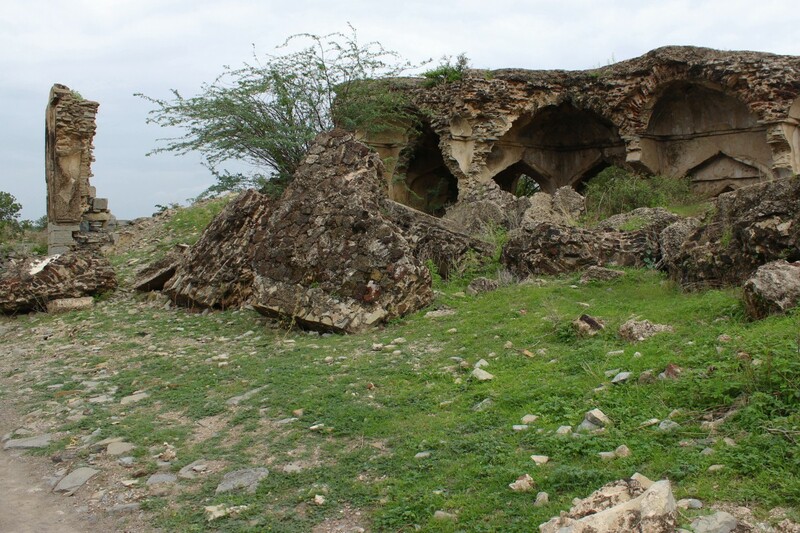 These collapsed lumps reveal a lot about the building methods of those times. This is the early form of concrete technology. Mortar must be a mixture of powdered lime, sand, red-bricks and rough cut stones. It seems they used scaffolding and centring equipment while building the roof. There are signs of pounding to compact the wet mixture. This structure doesn't have any domes as such. 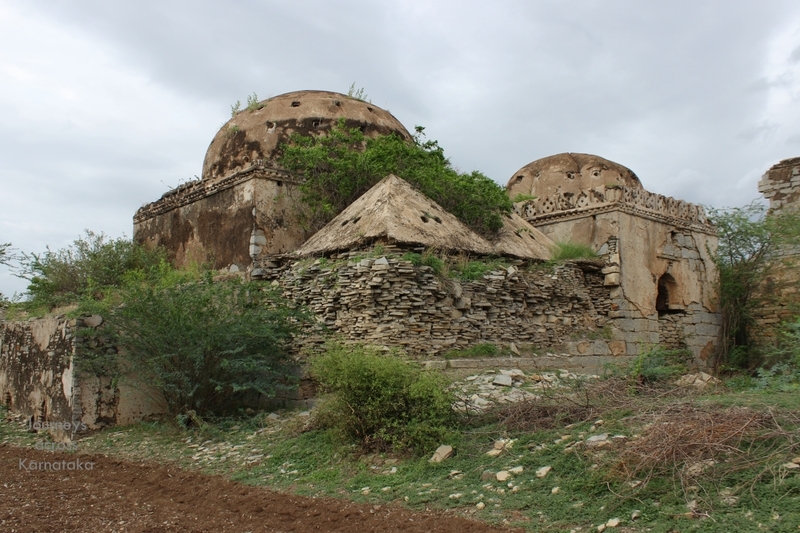 This neighbouring structure has five domes- the central hemispherical dome and four pyramidal corner domes. Approximate dimensions- central dome is 20' diameter and pyramidal domes are 10' square at base and 10' high. The building has a castle like look. probably this is a fusion of Indian and European styles. A question pops up- why the ramp of dirt at the entrance? Probably there was an attempt to conceal this building in dirt. Perhaps there was some valuables inside and the rulers wanted to be safe. There can be other reasons. Next, I'm trying to imagine this building without the dirt ramp.. surely it would have a grand look. Nowhere else I've seen this spherical-pyramidal combination building design can be seen. Seems like an experimental design which never became popular. 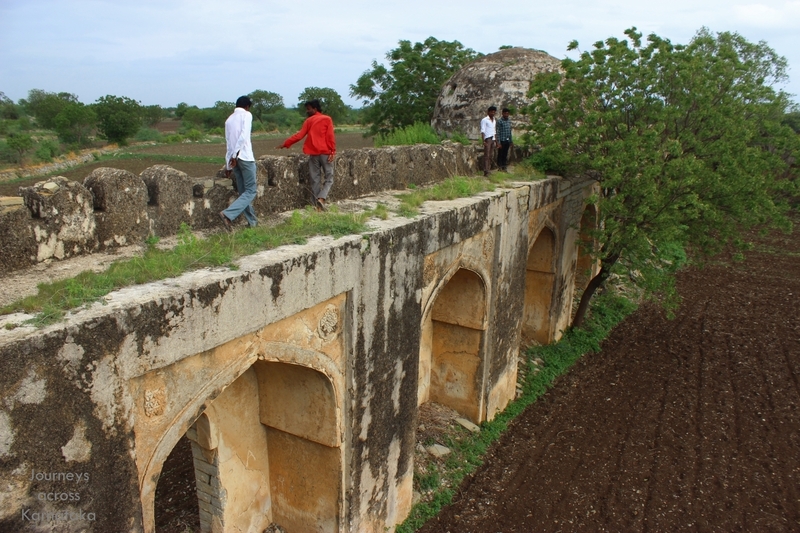 Our guides decide to show us the southern part of the fort. Because of time constraint, we had to limit our tour. Well, we continue walking through cultivated black-soil fields.. farmers waiting rainfall after which sowing will start.. cotton, green-gram, jowar and maize are grown here. 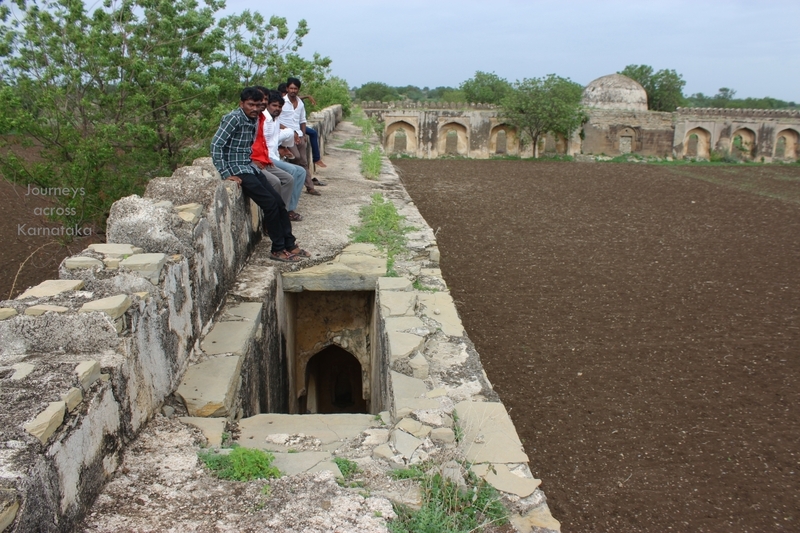 It seems last year was terribly hot and dry, villagers has severe scarcity of water. This year was better with some rains. 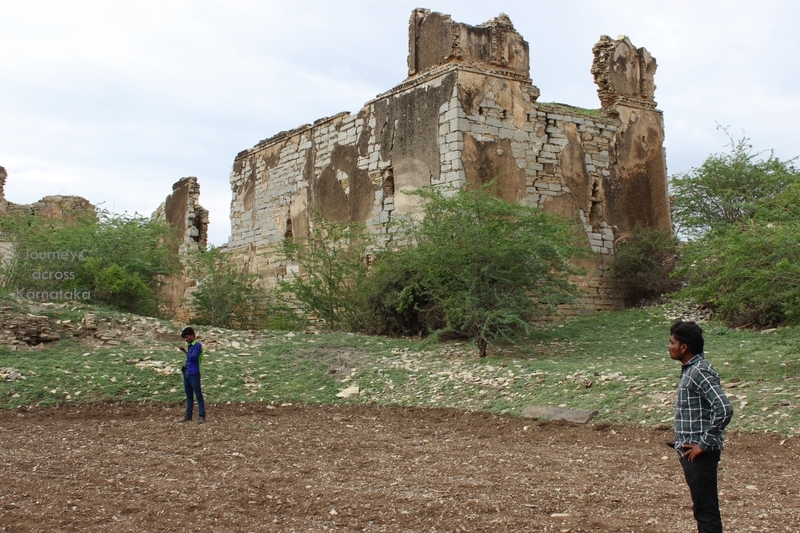 We pass by another group of ruins in the distance (see inset) as we head towards a four-sided enclosure measuring 102 meters x 64 meters.. 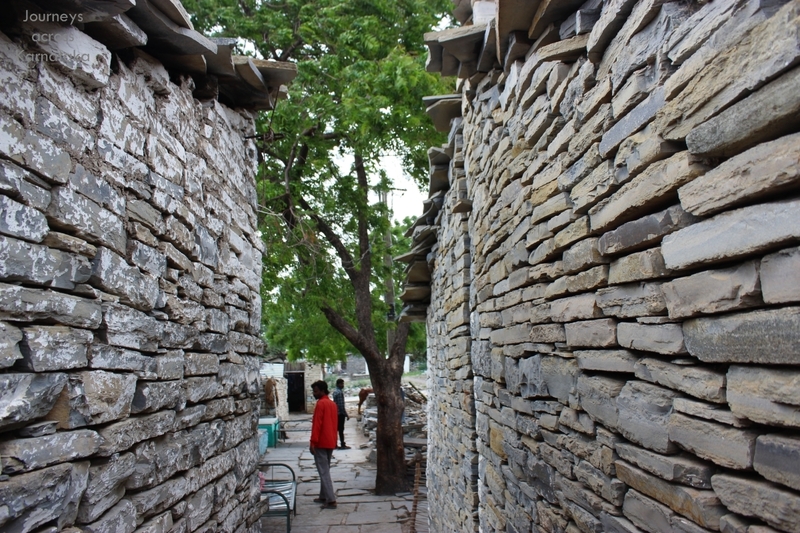 Within the walls are couple of stairways, we climb up to the top for better view. 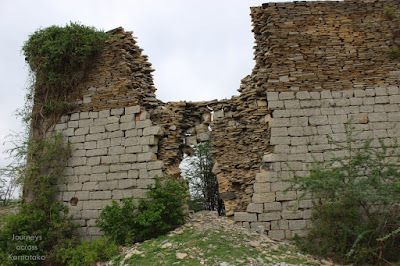 These walls are approximately 7' thick, In the walls are niches with doorways but most of the openings are blocked. This seems like a royal stable. Had it been intended for a palace, it would've built on a platform. Well, its not clear what is enclosure was for. On the eastern wall, at the middle is a square domed chamber - which might have been the administrative office of this enclosure. We walk along the shoulder. 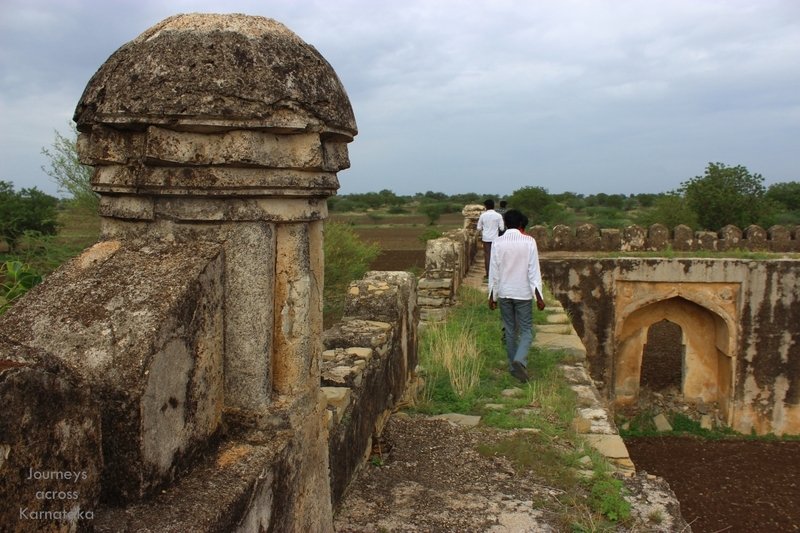 Below this point is one of the entrances with an arch and pair of minars. These walls are approximately 18' high. to have stood over 600 years in black soil, they were built by highly talented engineers. See how smooth the walls' plaster coating is. 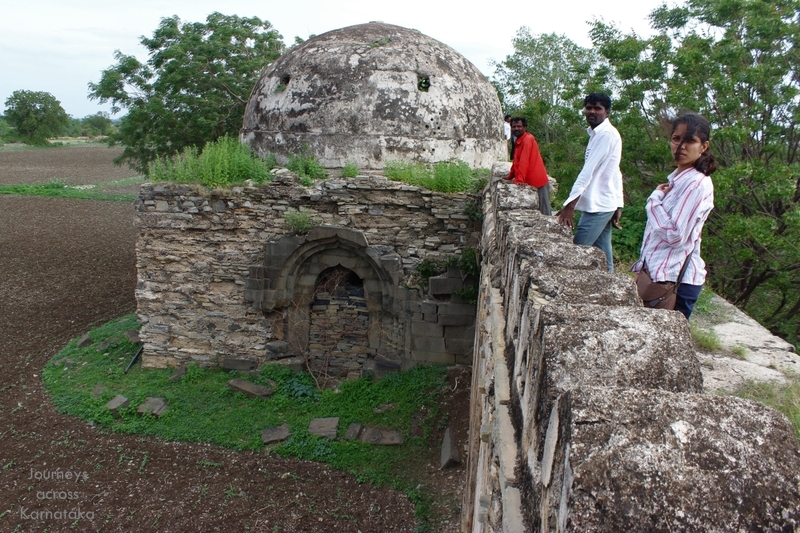 Here we are looking at the domed main entrance of this enclosure. Pushpa, though tired, handled herself. She always game for adventure :) Actually weather was tiring us.. it varied between being sunny and cloudy. And wind, though it blows away heat, can be tiring at times. 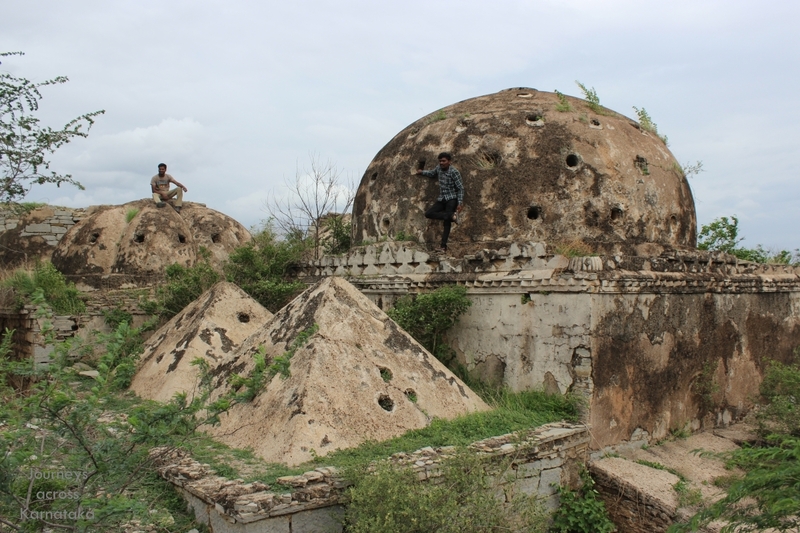 About 180 meters away is a two-storied structure which might have much higher had its dome been intact. The southern wall. 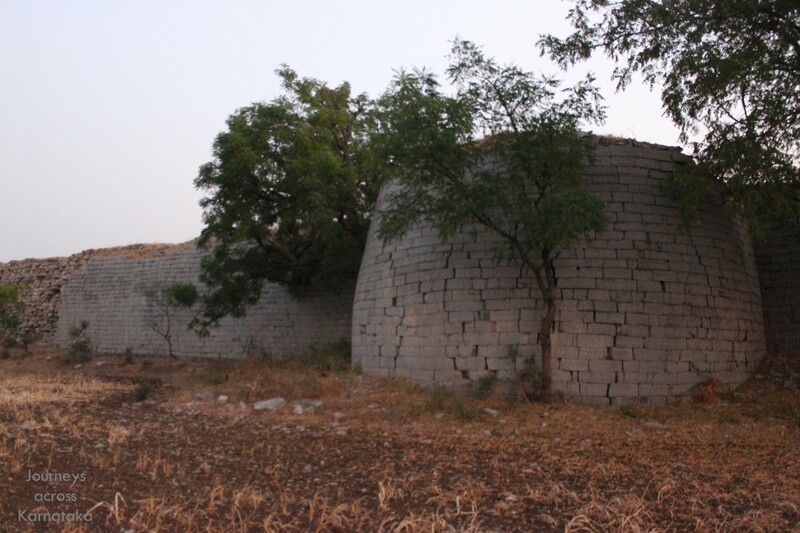 The wall is built of limestone blocks available in plenty in this region. The western wall as seen from outside, this is just one half. Notice the two small doorways, there were two more in the other half. At the middle is a chamber sans dome. We move towards another ruins of what would have been a grand structure. This would definitely be a palace. And right besides is another multi-domed structure. Even these structures have sloped heaps of dirt around them.. attempt to conceal them? Our guides offered to show us the interior but I declined for the sake of safety. We climb up instead. To the rear of this domed building is an extension with sloped roof. Talking of this structure, it has become infamous after a girl child's body was found inside. It was a case of murder. The girl's father, a Muslim cleric had killed her with a belief that the sacrifice would lead him to a buried treasure in this fort. Sad story of greed (or need) blinding a parent's senses. In above picture, on the horizon is a glimpse of river Bhima. 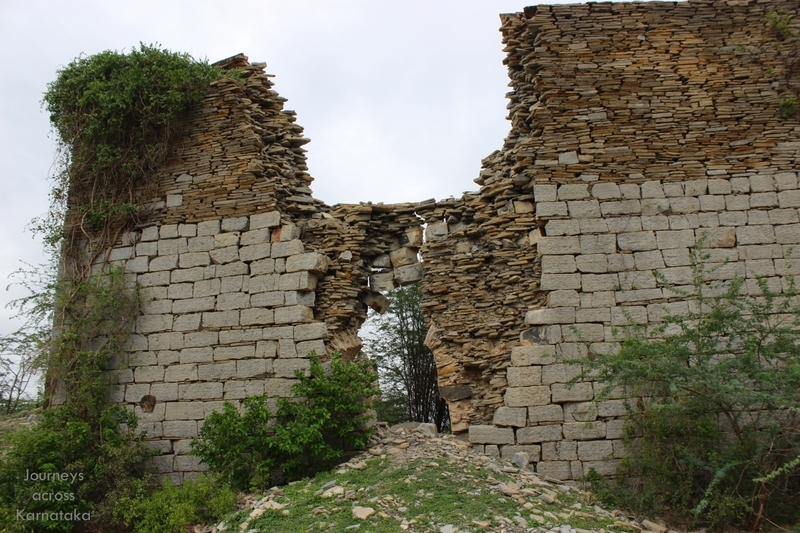 One of our guides wanted to show us a crumbling wall which has somehow managed to hold on, The collapsed portion of the wall has formed a heap at its base. This indeed is an amazing sight. I might not walk through this passage at all.. never known when it'll come down crashing. So finally, at the end of the tour we reached the main entrance of the fort. Builders have used black stone here.. the west facing gateway might have been known by the name Kaalaa Darwaaza or Mecca Darwaza. I think it was a practice to use black stones for certain parts of building. 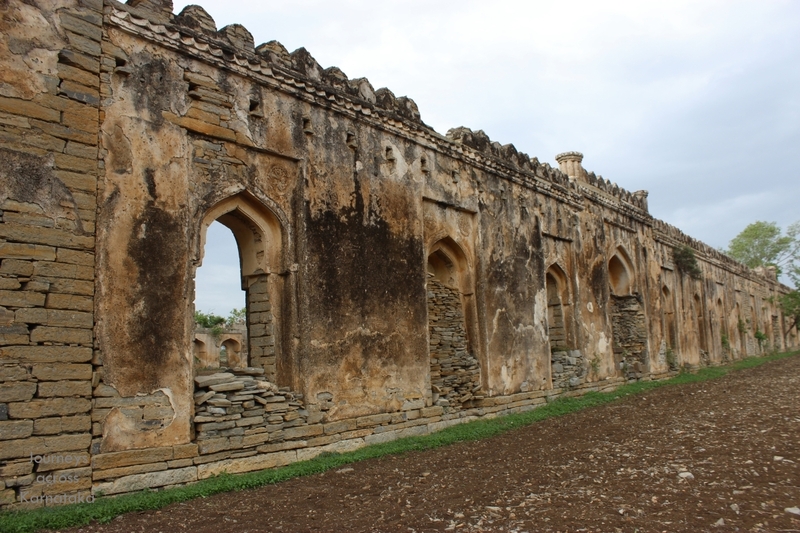 There are two other examples- Kaala Masjid at Malkhed fort and also at Naagavi fort. Our guides on the left.. their names are Gautam and Krishna. We reached the village by a different route. 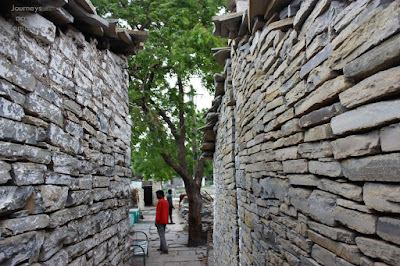 I liked the view through this alley.. Shahabad stone houses. Every part of the house would be built of these stones.. foundation, floor, walls, shelves, roof, bench, water tank.. See even the front yard of these houses is Shahabad stones. Back at the village, I inquired if there was a tea shop. No. Felt bad that I could not treat our guides a cup of tea :( Anyway, we thanked them and noted their phone numbers. I have a feeling I'll be visiting this fort again. So here we have a map showing river Bhima, NH-48, Shahabad-Firozabad Cross road and Firozabad fort. If you are at Gulbarga, its a easy trip to this fort. Early mornings of afternoon would be good time. We reached Firozabad cross and stopped at a bus-stop. After a face-neck-arms wash we felt better.. we still had to endure a 3 hour journey to Bijapur. 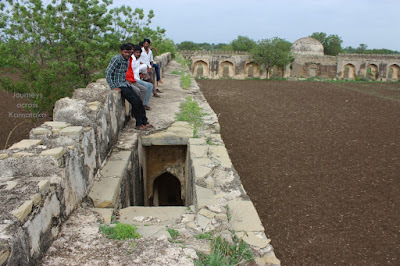 At Jevargi we stopped at a snack vendor for brinjal-bajji and continued our journey..
Amazing to know how these kings lived and engineering skills existed in the past. Good you enlighten us with Ur hard work SID!!! 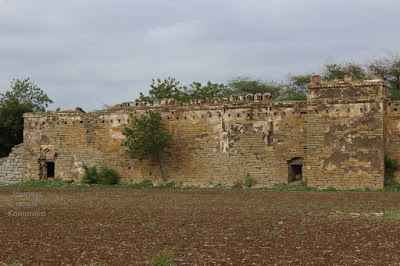 Nice to know about this fort. Detailed article. Great listed, Thanks for sharing..